With this Armarkat Extra Large Dog Bed you really do get bang for your buck. Your beloved dog gets comfort and you get a peace-of-mind, washable, non-skid dog bed. This extra large dog bed is much cheaper than other big dog beds. And, at the time of writing, it has a 4.0 out of 5 stars rating on Amazon for more than 2,200 reviews. That’s a lot of happy customers (and happy dogs)! This is one of the most popular and best large dog beds available (check today’s price here). Why is this one of the best large dog beds? This is not a memory foam bed but don’t let that put you off. Surprisingly, you get some advantages from this extra large dog bed that other dog beds don’t offer. Memory foam dog beds definitely have their place for large or older dogs. But some large dogs prefer a mattress that molds around them more. If your dog is a large breed or older or has a sore or stiff back, you’ll find advantages in this type of dog bed. The best large dog beds come in several different designs. If you’re prepared to be open-minded about non-memory foam beds, then this extra large dog bed will also save you some money. What’s inside to make this one of the best large dog beds? For the price, your dog gets great comfort. This big dog bed arrives in two pieces. The inside pillow part is one pillow folded into three sections. Each section is filled with extra thick poly fill. This type of filling molds around your dog but doesn’t flatten. The advantage of the pillow being in three divided sections is that it holds the filling in place so it doesn’t move down one end or the other after your dog has used it for a few months. The second item is the slip cover. The cover is lined in soft plush fabric on top. The slip cover is waterproof. This is important to know because you don’t need to buy an additional waterproof cover for this particular dog bed. This gives you even more value. You’ll also get the convenience of the cover being machine washable. The base of the cover includes a non-slip surface making it harder for your dog to drag it around a tiled floor. The pillow for this extra large dog bed needs to be slipped into the cover. This is not too hard to do. And you can easily remove the cover whenever you want to wash away that doggy smell. The cover has a zipper. XXXL Dog Bed – is this bed really big enough? This is definitely one of the best large dog beds for large breed dogs. 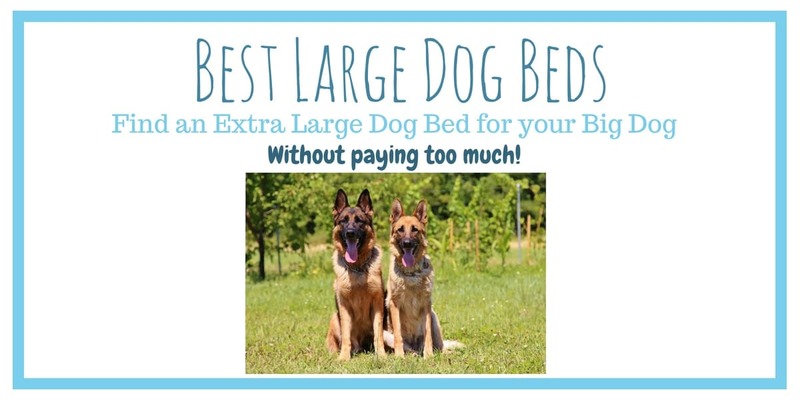 You’ll want to look at the “Extra Large” and the “Extra Extra Large” sizes in this brand if you’re wanting a big dog bed. The Extra Large size is 49” long x 35” wide and 8” high (check today’s price here on the Extra Large). For example, this size would be suitable for an 85-pound Labrador, 90-pound German Shepherd, 100-pound Rottweiler or even a 140-pound Great Dane. However, if you have a Great Dane or a large Mastiff you may want to consider the next size up. The Extra Extra Large size is 60” long x 43” wide and 8” high (check today’s price here on the Extra Extra Large). This is a big dog bed for giant breeds. It is hard to find these XXXL dog beds for a cheap price. This size gives you the extra length and width but still keeps the price affordable (and if you have more than one dog, this becomes really important). We are going from one extreme to the other on price here. The previous large dog bed was one of the cheapest, the next one is one of the best large dog beds but it is a lot more expensive. Why? I’ll explain why it costs more and what features it offers. But, interestingly, in the long-run it may work out cheaper for you than buying an cheap large dog bed. Once I explain it, you can be the judge on whether it provides you with value. The Big Barker Pillow Top Dog Bed is made from therapeutic foam. It’s made in the USA and it is calibrated for large and extra large dogs. It comes in 3 large sizes. Are these really XXXL dog beds? The Large Size Big Barker Dog Bed is 48” long x 30” wide and 7” high. The Large is suitable for Labradors, Golden Retrievers, Boxers and other breeds under 25 inches tall. The Extra Large Size Big Barker Dog Bed is 52” long x 36” wide and 7” high. The Extra Large is best for Rottweilers, German Shepherds and any other dog breed larger than a Labrador but smaller than a Great Dane. The Giant Size Big Barker Dog Bed is 60” long x 48” wide and 7” high. This Giant Size is designed for Great Danes. You could probably use it for another giant breed but Great Danes are the primary focus for this one. Each Big Barker Dog Bed comes with a 100% microfiber cover that is removable and machine washable. There are several colors to choose from (click here to see the current colors available). For the price, this waterproof cover gives you peace of mind on your BigBarker large dog bed. Click the image to see other sizes. Please note, the cover is not waterproof. But that’s not a problem if you want this feature. You can buy a waterproof cover separately for these large dog beds (see here for the price on the waterproof cover). It can be fitted underneath the soft microfiber cover. I like the option of getting the waterproof cover separately because it lets some people save money who don’t need it. And it let’s you buy it separately in case you need to replace it in the future. And if you want to change your home décor, you can always buy a new microfiber cover in another color (see the options here). What are the advantages of buying a Big Barker XXXL dog bed? The Big Barker in Large, Extra Large or Giant sizes is constructed using American made therapeutic foam. Your large breed dog is fully supported by this foam. An adult can also lie on the Big Barker foam dog bed and be fully supported next to a dog. Big Barker promises that these dog beds will retain 90% of their shape and support for the next 10 years or they’ll replace it. This is important. If your dog can keep using this big dog bed for the next 10 years you get bang for your buck. The cheaper large dog beds (like the one reviewed above) will usually only give you about 2 years of comfort for your dog. If you need to replace a cheaper large dog bed 5 times in 10 years you’re up to the same price as a more expensive Big Barker large dog bed. For this reason, you shouldn’t let the price influence your decision. If you have a large breed dog, it is important to get the best large dog bed that suits your dog. A cheaper bed may be the best for comfort anyway for your dog, and that’s great. But do consider that you’ll need to replace it more often. If your veterinarian has told you that your large dog needs an orthopedic dog bed (large) then it is important to consider one of these therapeutic foam dog mattresses. See today’s price, Click Here. There are a number of foam dog mattresses available but when you have a large or giant breed of dog it is more important to get the correct one to support your dog’s weight and size. The therapeutic foam used in the Big Barker dog beds specifically supports the joints in larger dogs. If your dog is over 50 pounds then you need to consider their joints to keep them healthy. The Big Barker big dog beds are only made for dogs over 50 pounds. The Big Barker big dog beds have a rating of 4.9 out of 5 stars for more than 3,100 reviews on Amazon (at the time of writing). I think this is the best rating I’ve ever seen on a product on Amazon. That’s a lot of extremely happy customers. This really is one of the best extra large orthopedic dog beds. Need more evidence it’s one of the best large dog beds? One of the most convincing factors for me is seen in the “pressure maps”. Take a look at these pressure maps from Big Barker. See the orthopedic dog bed large (pressure map on the left) and you’ll be impressed. You can see how the orthopedic foam distributes your dog’s weight evenly and avoids pressure points. If your dog likes to “nest” in a bed then you may want to get a bolster dog bed for them to snuggle into. This BarksBar Large Bolster Dog Bed is 40″ x 30″ for the outside dimensions. The inner sleeping space is 36″ x 24″. This bed is ideal for dogs up to 100 pounds and up to 36 inches in length. This BarksBar big dog bed is suitable for dogs such as German Shepherds, Border Collies, Pitbulls, Labrador Retrievers or any dog that likes to nest and is under 100 lbs. Lots of dogs like a blanket in their bed and there’s room for one in this dog bed to make it even more comfortable. If your dog likes to prepare the bed by “fluffing” it up with his or her paws, you’ll need to use a few blankets or towels in it to allow your dog to fluff it up without ripping the actual dog bed. This large dog bed is constructed from an orthopedic foam base and the sides are cotton padded bolster walls. The cover is a soft polyester plush cover which is removable and machine washable. The cover includes a non-slip rubber backing to stop it sliding over wooden or tiled floors (check today’s price on the BarksBar snuggle bed here). This is one of the best large dog beds if you need a snuggle bed but unfortunately it is not waterproof. However, there is a way to overcome this. The cover is removable so if you place a dog pee pad on the foam base underneath the slip cover then you can simply wash the cover and remove the pee pad if your dog has an accident. Who is this big dog bed for? It can be difficult to find an extra large dog bed with bolsters if your dog likes a snuggle bed. This is one of the best large dog beds for size and snuggle. Some dogs start with a snuggle bed when they’re younger and they don’t want to give it up! This BarksBar bolster dog bed is a great option for a large dog. So, if you’re looking for the best large dog beds and your dog is under 100 lbs, this snuggle bed could be perfect. This pet bed is so luxurious and soft and cuddly, I wish I had one for myself! If you have a large dog that likes to snuggle down in a bed then this is the best dog bed for you. You can see by the shape that this cuddle bed is soft and warm once your dog is in it. If you’re in a hot climate during summer this may not be appropriate. But for winter, it’s perfect. At 45″ x 45″ dimensions, this is good for a large dog or two medium size dogs to share. The deep crevice between the base and the wall of this bed allows your dog to snuggle in and feel secure while the raised rim provides head support. The faux fur cover is removable and all the bed is able to go in the washing machine and dryer. 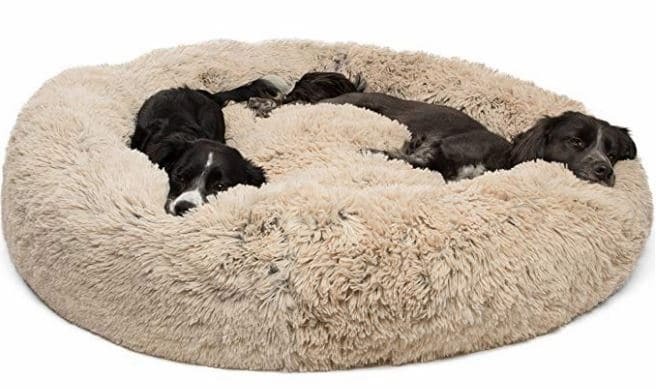 This extra large cuddle dog bed is made from nylon and pet safe faux fur. The base is water resistant. The cover should be placed in the dryer (on low heat), rather than air dried, to avoid the fur becoming clogged together and losing some of its fluffy allure. If you’re looking for one of the best large dog beds available in a donut style then this is perfect for your large dog. This large faux fur dog bed holds a maximum capacity of 180 lbs. You may want to use it for one large dog, two medium dogs or one large and one small dog together. This extra large pet bed is not cheap but it will provide your dog with a feeling of security and comfort. If your dog has more than one bed, you’ll probably find he or she goes to this one as the preferred bed. If i had a faux fur bed like this one, I’d go straight to it too! ⇒ Worried about your dog eating too fast and choking? See more on Slow Feeder Dog Bowls here. This entry was posted in Comfort & Mobility on May 30, 2018 by Didi.